I’ll provide a quick summary from a book I read last month and how this book can give you insight for your business ideas, app ideas, or Kickstarter projects. Buy the book on Amazon using my affiliate link below to support this podcast. I highly recommend this book to anyone who plans to make an app, create a product, or provide a service. It has opened my eyes to different trends within the marketplace and helped me to understand the strategy behind naming . . . something that, while extremely important to me, was difficult to describe until reading this book. Get the quick summary, memorable quote, and how this book can make you think about your business ideas, app ideas, or Kickstarter projects. 1. Do NOT use acronyms for your name or business name. It loses meaning and only works for the established players. Use a name that is simple to remember, and avoid anything that is clever just for the sake of being clever. 2. A word has no meaning until someone fills it with meaning. Webster’s Dictionary is not a guide; your target demographic is! Volkswagen means economy car, while Audi mean medium-sized luxury cars. Names need to be associated with a type of product or service (your product can’t be both premium and cheap) The name has to make sense to people, it has to be intuitive, and it can’t just have meaning to you and your business team. 5. Be willing to sacrifice some of the market. NyQuil, for example, launched in a crowded space as “nighttime” medicine rather than competing with other all-day medicines. They gave up the daytime market, yet found great success. 6. You are capable of marketing without a marketing background: too much success can misguide you. Xerox had a disappointing record with computers—they are known for copiers. IBM had the same issue with their plain-paper copier—they are known for computers (and now business services). 7. Trying to attack the #1 product in your industry is fatal. Bristol-Myers repeatedly tried to create products that could compete with [insert company they tried to compete with here]; these attempts resulted in $5M and $11M marketing flops. You can’t afford to compete with the marketing dollars of the established players – differentiate your product from them in an area that you could own. 8. Products that focus on being better instead of focusing on something that matters (like “speed”) will always fail – look at Apple’s marketing. To launch an improved product, you need to quantify it in the buyers mind and be willing to spend money on marketing it. 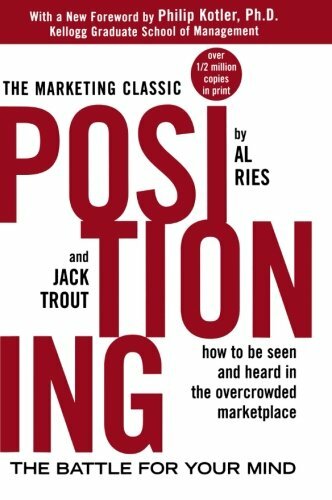 The book is a little dated with some examples, however, the insights offered and the examination of the successes and downfalls of various market leaders are fascinating—if you’re like me, you’ll find that you can’t put it down. Bottom line: pick a name that is minimalistic and easy to remember while capturing the product’s essence (for example: Mustang), and avoid acronyms at all costs! When you go to make your next app or launch a Kickstarter project you are going to have to think about naming. Don’t waste months on this, but do spend 2-5 days thinking through options. I like to take a walk and in my notepad I’ll jot down ideas and then I’ll do web domain checks. If I can get a web domain, then I check the Trademark database to see if anything exists. I’m not doing a comprehensive search, but I am looking to make sure that nothing fills the space in the field that I’d like to make a product. Too many startups choose clever names (remove one or more vowel), compound word, or super long word. These names always felt strange to me and the book gave me real world examples that helped provide context to why I didn’t like them (and how the market didn’t either). Your own personal brand is something that you can establish with simple steps. Do these same steps with any new product – I just made a new website for a new app I’m publishing (2 hours to create – 7 email subscribers). Change your eating habits to promote clearer thinking and focus at work or at home. Use these 5 rules to guide your next meal throughout the day. Eat veggies and fruit before carbs, meats, fried food, etc. I've lost around 20 pounds by focusing on what I eat and preparing better meals for breakfast and dinner. Eating veggies and fruit in the mornings and for lunch helps me avoid the food coma that I used to suffer from and allows me to focus better on my creative work. I cut out most dairy during the day (cheese at night) so that my throat doesn't get gunky – which allows me to record with less effort and less takes (usually a single take for my videos or audio productions). Get the scoop on my book recommendation for April 2015 and why you need to read it (as it pertains to apps + sales on Kickstarter). Do you want my daily smoothie recipe (vitamix)? Learn about Paul’s initial in-store impressions from the new Macbook 12” laptop. It has an all new design with only one usb 3 port (reversible) and is smaller and lighter than the 2014 Macbook Air. Please rate the Creative Person Podcast on iTunes. Post a question you have about the Macbook and I'll answer it in an upcoming episode. I ordered the 1.2Ghz Macbook 12” with 512gb flash at 3am – the 1.3Ghz was a 3 week shipping delay. I typed 69 words per minute on both Macbook 12” keyboard (14 mistakes) and Bluetooth Apple White Keyboard (7 mistakes) http://www.typeonline.co.uk/typingspeed.php I was more pressured at the store, but I also felt more fatigued typing on my bluetooth keyboard during the test. It is a great laptop and impressive replacement for the Macbook Air. Get it if you surf the web, write papers, or watch movies. It’ll be amazing and fast enough for all your work. Learn about Paul’s hands on experience at the Apple Store where he was able to try on 5 different Apple Watch models and play with the user interface. Find out which Apple Watch is the best for you by scheduling an appointment. I tried on 5 different Apple Watches. I explored the modern buckle and metal link mechanisms. Both are really neat if you enjoy precise engineering and magnets. I prefer the 44mm Apple Watch (bigger screen) – my wrist is around 165mm (6.5 inches). The sports band is extremely comfortable. If you like metal, the milanese and metal link bands are very well designed. The heavier watch "head" makes it a little more awkward to put on the watch (first time users). I assume this will become second nature on a daily basis. Some buttons were either hard to tap, or unresponsive – this could be from the guided tour being limited on the desk top Apple Watch kiosk. The try on Apple Watches are a guided tour – you can't do anything except feel the band, haptic feedback, and see the types of interactions that are possible via a recorded demo session. You can't use any of the interesting features (health, fitness, and real taps from humans) until April 24th or later. Developers are going to have to re-imagine how to create pleasant app experiences – the demo unit is limited to only Apple's apps. Native Apple Watch apps are coming later this (or next) year. Schedule an appointment online – and if you're adventurous order it from the Online Apple Store (the only place to buy watches until supplies are less constrained). Which Apple Watch are you getting? Reply below or post a review on iTunes with your preference – or any questions that I didn't answer in this episode. Habits allow you to automate some of your daily thinking and can give you more time to focus on the things that matter most. Health, fitness, family, and productivity. Here's a list of habits you can start. I was inspired to start push-ups because of James Clear. Too easy, why even bother? Don't listen to the negative people, just do it. Starting is always the hardest part – make it so easy that’s stupid simple to start. What's your favorite habit? Comment below or post it on iTunes in your review (every star helps!). Make the perfect craft cocktail using Highball on iPhone and get answers to questions about solo founders, beta testing, personal branding, and Kickstarter. I dig into what makes this app great – especially the user on-boarding and the ability to buy something with Apple Pay or leave a tip with In-app purchases. This is what you need to be doing in your iPhone apps! Studio Neat is killing it with product design and funding through Kickstarter projects. What is your feeling on founder teams vs. solo developers? How long should you beta test before releasing an app? How many people should test your app? I'm very much interested in improving my social presence so I can sell apps as they are submitted and get views on my website. Wants to learn how to finance his app that is almost complete on Kickstarter. Pushing past the finish line. I'm going to be teaching you the thought process for creating an app that can solve a problem – something that you can sell on the App Store for $20. I've been using this app called "Chemex Brewer" for the past 2 years gathering data and trying to figure out what features were important. It started bare bones and I refused to add features until I fully understood the problem and the coffee domain. Now I want to give myself 1 month to get a version 1 on the App Store and potentially the Apple Watch (if the timing works out). The goal for this app is to make something that my mother (or stubborn father) could use to improve their morning cup of coffee. I have been studying how to brew coffee after I discovered that brewing Chemex was a little more technical (and scientific) than I thought it was. It turned out I was brewing coffee wrong for over 1 year in my Chemex. With app development skills in hand I made a simple prototype that helped me brew coffee better – now I want to publish it on the App Store so that my mother and father can use it. While I do believe that this app has the potential to make millions of dollars – it's not just the direct app sales. It's the bigger picture that you need to start to think about. I think that money can be an enabler to focus on creative projects, but it should not be the motivator. Solving problems is my motivation and the iPhone app programming skills allow me to create something that can be used world wide. I believe this is a million dollar app idea. It’s a vertical where people spend tons of money. $18 billion/annually on coffee in U.S.
Creativity thrives in a constraint driven world. You have limited time, money, talent (people), and access or hardware limitations. Within these constraints you can make an app or a product – you have to be creative to work within your limitations. Riff is littered with poor UX choices and a lack of intent when trying to create a video and then work on a collaborative video. The negative reviews provide a clear direction into what is wrong. It's made by the iOS group that's doing some amazing work – but this app just doesn't live up to the quality bar. The Riff app reminds me of Google's PhotoVine app that was through an acquihire of Slide. Please rate this podcast on iTunes and post a question for the next episode.